I have a few embarrassing confessions. Once upon a time, I had a love/hate relationship with my refrigerator… but more hate than love. There never seemed to be enough room in the fridge despite my efforts to randomly push, stack and balance containers of food. Fruits and veggies often spoiled in the crisper drawer. I felt like I was constantly buying duplicates because the things I needed were hidden in the deep dark depths of the fridge. Sometimes I’d even find forgotten leftovers and moldy treasures. What a waste of money, food and time! My life was incredibly busy and my fridge had become wasteful chaos. That chaos was costing me money, time and my patience. Not to mention wasting perfectly good food. Even though I was short on time, I decided to find the root cause of each problem and come up with the quickest/easiest solution. The two pictures below were taken 19 minutes apart. All the food from the picture on the left is also in the picture on the right. I did not throw anything away or remove any food from the fridge. I simply used the strategic solutions now follow religiously. The “after” picture isn’t perfect but perfection isn’t the goal. 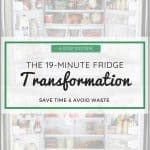 The goal is for the fridge to be functional and effective for day-to-day life in as little time as possible which is what the “after” picture represents. 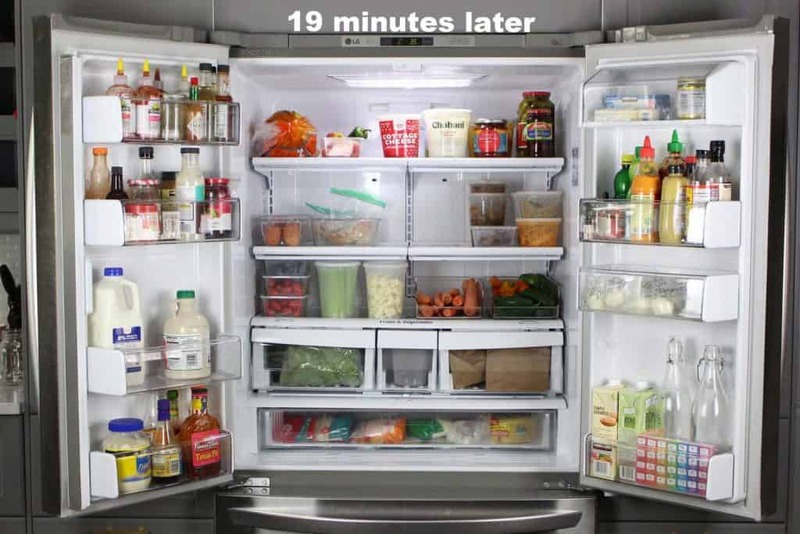 The amount of food you’re able to fit in the fridge is less about actual space and more about simple organization. Double or even triple the amount of food you’re able to store. Spend 3 seconds or less looking for what you need. 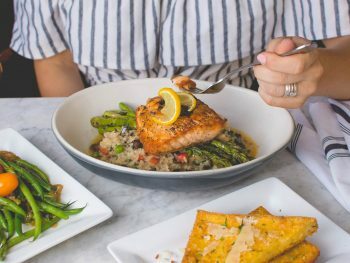 Eat more vegetables and leftovers instead of letting them spoil. Stop wasting money buying unnecessary duplicates. Time is a valuable and sparse resource. This 4-step system focuses on the 20% of actionable items that create 80% of the results. Spend a quick 20 minutes upfront, using this system, to reap 10x the time-saving benefits afterwards. Although this system can be used at any point, I recommend using it right after grocery shopping and prior to putting groceries away. 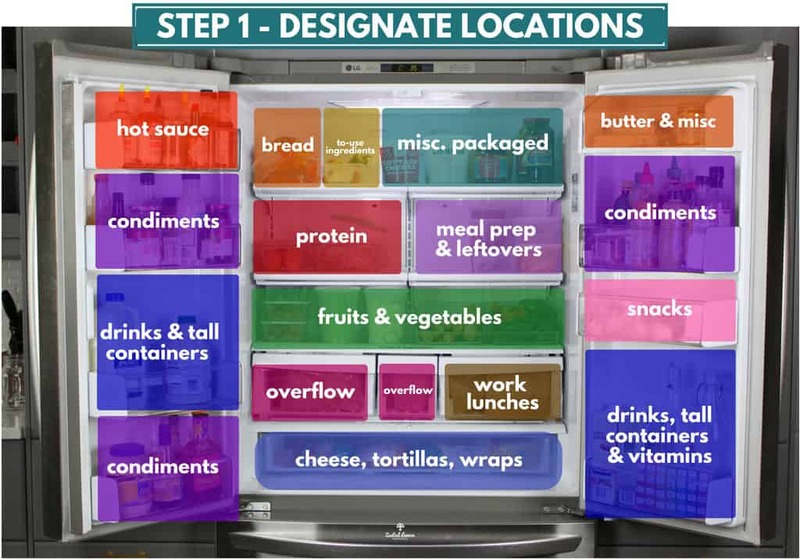 Designate locations in your fridge for specific categories of food. I recommend having an overflow spot for when you need more storage space for any specific category of food. This helps make your storage space flexible while remaining consistent. Tip: Designate a shelf that is easy to access and directly in your line of sight for fruits and vegetables. Avoid storing them in the crisper drawers. 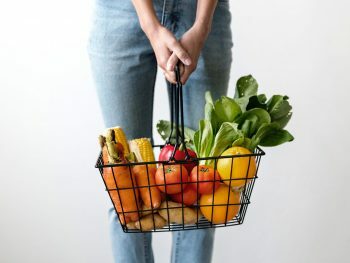 If all the fruits and vegetables can’t easily be seen immediately upon opening the fridge, they are far less likely to be eaten before they spoil. These are the designated locations in my personal fridge. 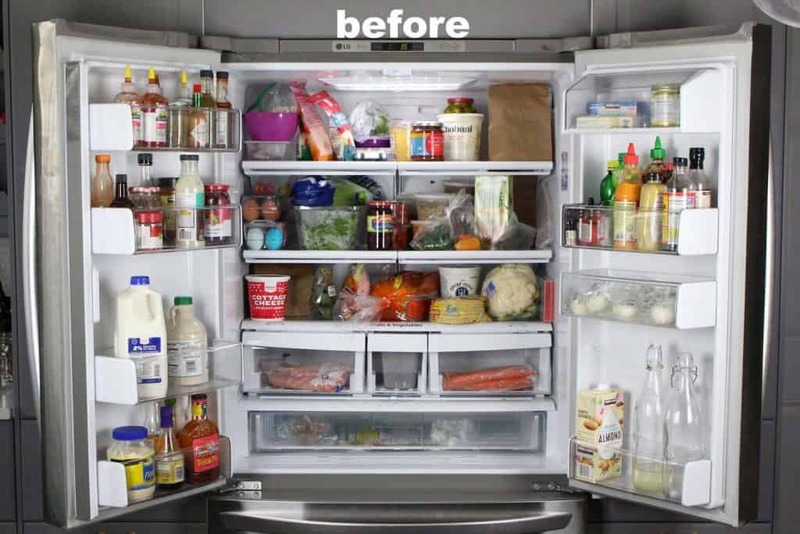 Setup your fridge so that is works best for you! The goal is to reduce clutter, save space and enhance organization. To do so, it is imperative to remove miscellaneous dishes, oversized foods and original/excess packaging. Plates & Bowls – Avoid putting miscellaneous plates and bowls of food in the fridge. 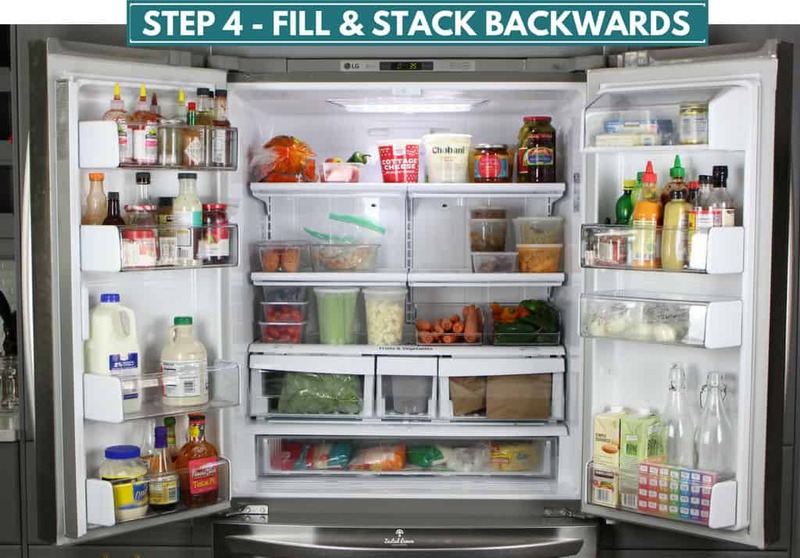 Instead, transfer the food to transparent stackable containers (step 3) before refrigerating. Large Fruits & Veggies – Condense large/cumbersome fruits and vegetables by cutting them into pieces that are easier to store. In the example above, celery was cut into sticks and a head of cauliflower was cut into florets (pieces). Other examples may include melons, large carrots and heads of cabbage. Original Packaging – Remove fruits, vegetables, protein and other applicable foods from their original packaging. 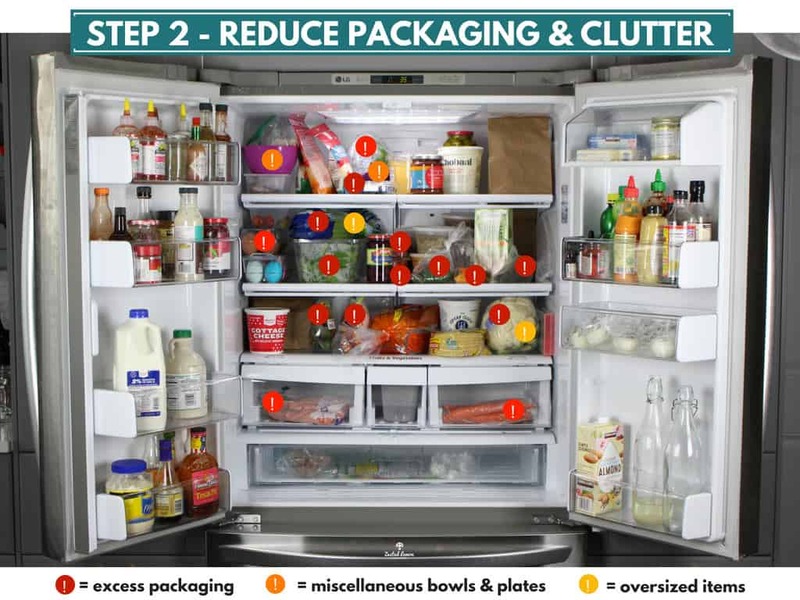 Original packaging simply adds clutter to the fridge and makes it challenging to see what you have. Things like yogurt, salsa, condiments, pickles and cheese can remain in their original packaging as they are easily stackable and add minimal clutter to the fridge. 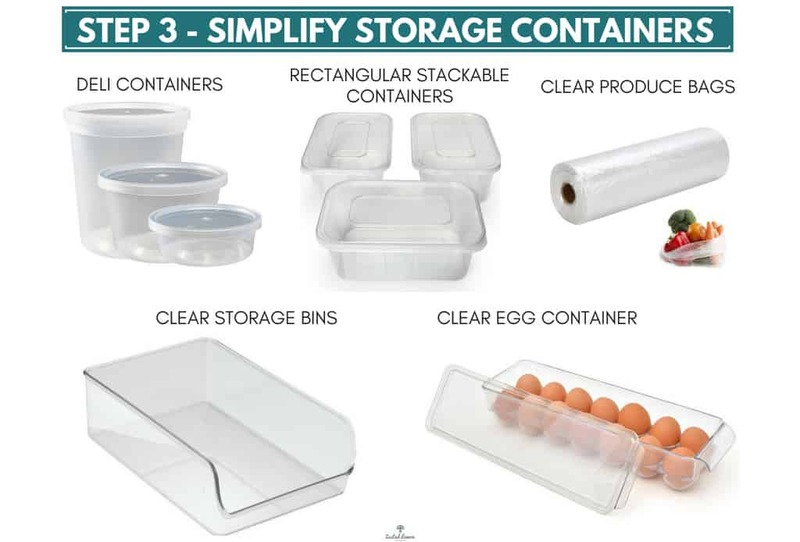 After completing step 2, store individual foods, leftovers and meal prep in transparent stackable containers, clear storage bins, ziplock baggies or clear plastic produce bags. Deli Containers: These are particularly useful because they come in a variety of sizes but they all use the same lid. This means you won’t have to spend any time looking for matching tupperware lids. The stack-ability and efficiency of these containers are amazing! They are good options for storing fruits, vegetables, leftovers, meal prep and pretty much anything else. As a side note, replacing a drawer of mismatched tupperware with these containers is life-changing. Rectangular Stackable Containers: These are great for meal prep and delicate foods like berries and cherry tomatoes. The shape and stickability are very conducive for efficient fridge storage. Clear Storage Bins: Put protein like chicken and fish in separate ziplock baggies and store them in a clear bin designated for protein. The protein bin is located on the middle left shelf next to the eggs in the picture below. Bins are also a good option for fruits and vegetables like carrots, peppers, cabbage and cucumbers (pictured in bottom right shelf). Clear Egg Storage Bin: I used to think a storage bin specifically for eggs was unnecessary and excessive but after using one, I’ve changed my mind. It helps keep my fridge clean, simple, transparent and organized. Clear Produce Bags: Use these for storing spinach and other leafy greens. Whether greens come in a box or a bag, removing them from their original packaging and placing them in new produce bags helps keep them fresher longer. They take up far less space than large boxy plastic containers. Put the food back in fridge in designated areas. The goal is to be able to see every food without having to move anything. 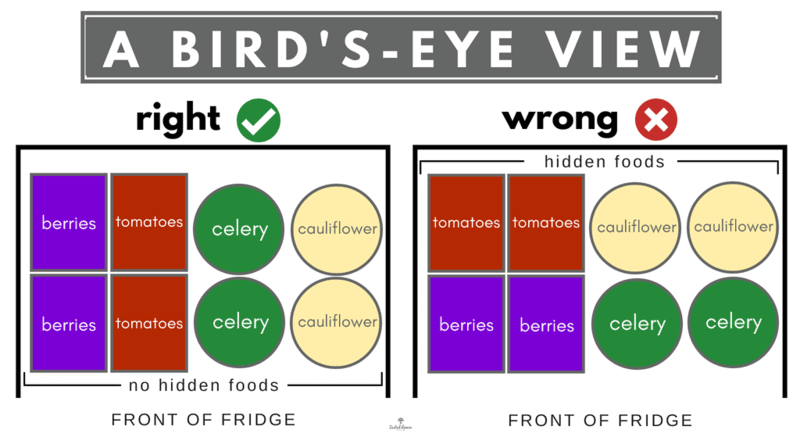 If multiple containers contain the same food, stack them backwards instead of side by side (see Bird’s-Eye View diagram below). This quick system has changed the way I store and use food. My fridge is clean, organized and functional. 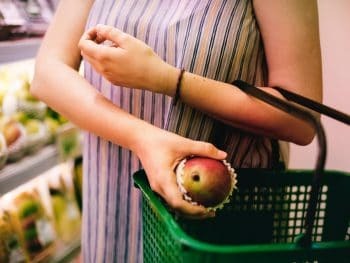 It makes it easy to eat everything you buy because you can see it which means less waste. Give it a try! Don’t hesitate to shoot me an email your questions or comments.